Right, Wing-Nut! : To End Gun Violence, Try "Stop And Frisk"
As of yesterday, there were 413 homicides in the city this year, according to police. There were 511 at this time last year. That marks a 19 percent plunge in a single year — a remarkable feat. Kelly rightly attributes his success to aggressive law-enforcement tactics, including stop-and-frisk, the routine searching of people the police suspect are carrying illegal weapons or other contraband. Chicago and Detroit don’t perform stop-and-frisks; Philadelphia used the tactic, but its hands have been cuffed by the courts this year — to predictable results. The twin priorities sought by Bloomberg and executed by Kelly — locking up criminals and restricting the flow of weapons — have ushered in a stunningly low homicide rate compared to other big cities. They are simple law-and-order policies, but the results are nearly miraculous. 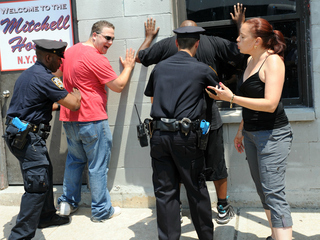 At the moment, the NYPD faces three (yep: three) major lawsuits and a mountain of legislation all aimed at deep-sixing its wildly successful stop-and-frisk program. What the critics seek, in a nutshell, is control of the NYPD itself. And even if the council or judges don’t appoint themselves police commissioner, there’s still trouble ahead: The winner of next year’s mayoral race might well order cops to stand down — ceding the streets to the thugs. New York’s leftist judges also see it as their mission to undermine cops. Just recently, for example, the state’s top court refused even to hear an appeal of rulings that let two teens, in separate cases, walk free — after being caught red-handed with loaded guns. Cops had watched the teens, Darryl Craig and Jaquan Morant — then both 14 — acting suspiciously. After questioning the two, officers found loaded handguns on them. Both were convicted, but appellate panels overturned the convictions, claiming the cops lacked “reasonable suspicion” to search them. One judge said an arresting officer acted on “a mere hunch.” Again, the searches in both cases turned up loaded handguns. If that isn’t proof the cops took wise action, we don’t know what is. Truth is, the officers deserve medals — and the kids, time up the river: Three months after Craig’s arrest, he was charged (surprise!) with attempted murder, after shooting someone. It's about control. If they disarm Americans, and free the criminals, they make the majority dependent upon the government for their very lives. Cops and politicians call Interstate 95 the "Iron Pipeline" because it is a popular route for criminals smuggling firearms from the South into Newark and other Northeastern cities where gun violence abounds. A big link in that pipeline is the New Jersey Turnpike, where the State Police used to seize scores of guns every year. The decline comes at a time when homicides and shootings are on the rise in Newark, the state's largest city, where cops are taking record numbers of firearms off the streets. When those illegal guns are traced to their original sale, the most common source states turn out to be along the I-95 corridor in the South. The Left, and the Democratic party, is waging war on black America. Is there a Republican in the room with enough guts to say it?